Smokin' Summer Spice Dry Rub, the most versatile Barbecue dry rub ever! Smokin’ Summer Spice Dry Rub. The only barbecue spice dry rub you will need for the entire season. A delicious blend of smoky herbs and spices that’s delicious on burgers, chicken, steak, beef brisket, pork and absolutely anything that comes off your backyard grill or out of your back yard smoker. With the barbecue and grilling season now upon us, I have already been using the backyard grill and barbecue smoker quite a bit. One of my backyard summer cooking essentials is this versatile dry rub spice and seasoning mix which I have tweaked over the last couple of years to suit my preference. You can adjust any of the ingredients to get your own personally balanced version but I think all of the players in this mix bring something to the flavour party. The first photo shows one of my favourite things to smoke using this rub, a brined centre loin of pork. The few seconds of video below shows the pork loin after several hours of slow smoking at 250 degrees F.
You can tell from the video just how juicy it is inside! Sliced thinly, it goes great with beans, cornbread and coleslaw or it makes terrific sandwiches, hot or cold. If you have never had smoked chicken wings, you are in for a treat with these. 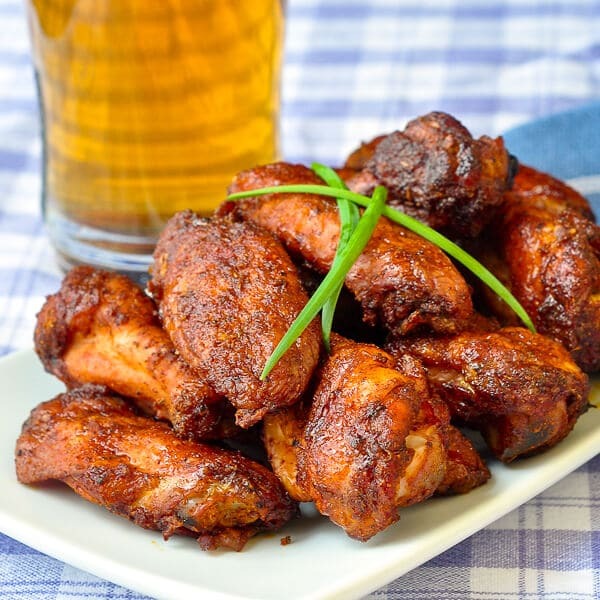 Large wings take only about 2 hours at 250 degrees to fully cook in the smoker. You’d better fill it to capacity because when your family and friends get their first taste of these there’s going to be a stampede to get to them. The dry rubbed ribs above are very slowly open baked in the oven and the smoked version of the exact same ribs is pictured below. I use this has a spice dry rub for slowly barbequed or smoked ribs, pork loin or beef. It also makes a delicious seasoning for grilled pork chops or steak and it is now my go to-seasoning for grilled hamburgers. I sprinkle it liberally on both sides of the burger patty before grilling for what I think is one of the best seasoned burgers you can find. This flavourful summer spice dry rub can also be liberally rubbed all over the outside of pork loin, tenderloin or beef roasts and then slowly barbequed or smoked under indirect heat at about 225-250 degrees until the internal temperature reaches 145-150 degrees F for pork and about 130-135 degrees F for beef roast. I sometimes smoke a pork loin roast, as pictured, or an eye of round roast just to serve them as cold cuts during the week. Thinly sliced, they both make phenomenal sandwiches! If you are using your gas grill to barbecue, place the meat on one side of the grill and use the burner or burners on the opposite side so that it is not directly over heat. Regulate the gas to keep the temperature at about 250 for slow barbecued flavour. The same technique can also be used with a charcoal grill, just keep the charcoal on one side and the meat on the opposite side. You can add smoke flavor by soaking hardwood chips like mesquite, apple, cherry or hickory in warm water for about a half hour. A couple of handfuls will do. Wrap the soaked wood chips in a double layer of heavy duty aluminum foil and poke only two holes in the foil, one at either end to allow the smoke to escape. I place the foil packets in a vegetable grill pan so that the packet is not sitting directly on the gas burner. You can add more soaked wood chip packets as they burn out, it all depends on how much smoke flavuor you wish to add. Smokin’ Summer Spice Dry Rub on smoked brisket sandwiches. 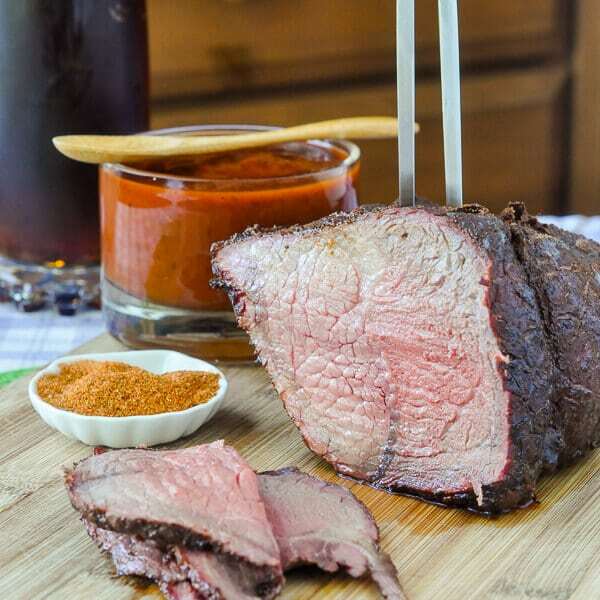 Smokin’ Summer Spice Dry Rub on slow BBQ beef round roast. Delicons, thinly sliced and served with BBQ sauce on sandwiches. 2017 Update. We still use this amazing spice blend all year long and I was recently making a double batch for the spring frilling season ahead. Unknowingly, I had been adding all of the ingredients to one side of the food processor as I was measuring them out. 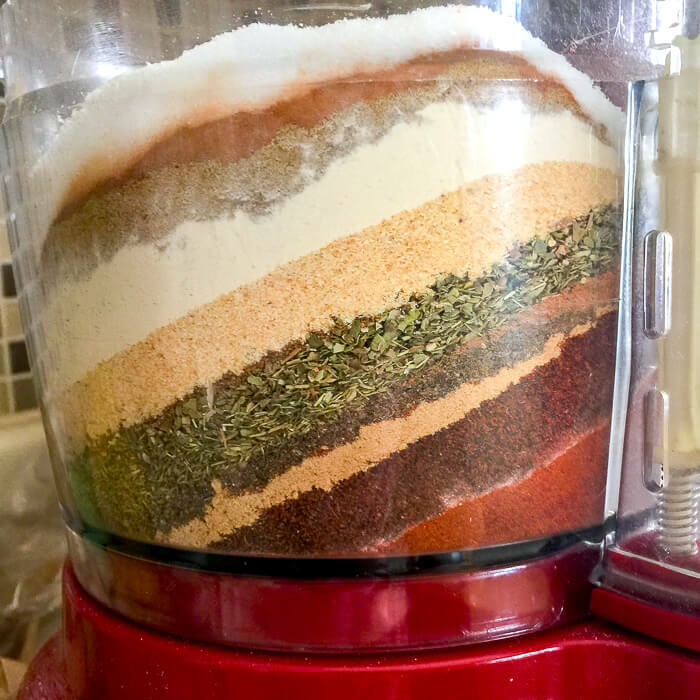 I was about to hit the start button when my eye caught the colourful layers in this flavourful, versatile dry rub mix. Some of the lightly smoked pork loin pictured above provided the inspiration for one fantastic brunch dish too. 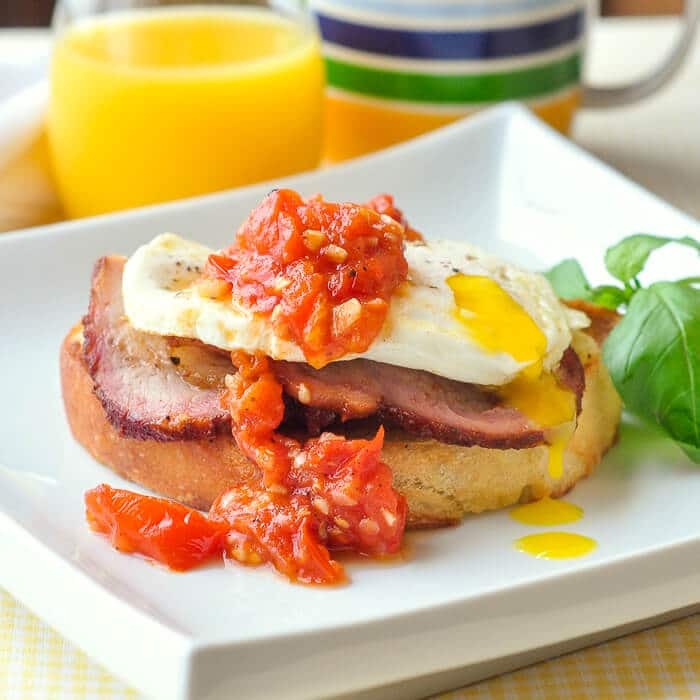 Warmed and thinly sliced, the pork sits on some buttered and pan fried artisan bread and is topped with an over easy egg and my favorite, quick-cooked, spicy tomato compote. Find that recipe in the notes below. 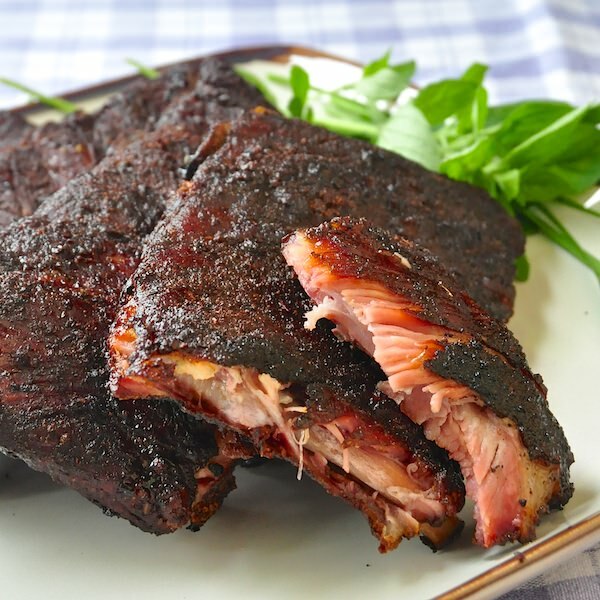 Like this Smokin’ Summer Dry Rub recipe? Smokin’ Summer Spice Dry Rub A versatile summer spice rub recipe to season anything on the grill or in the backyard smoker. For ribs, chicken, burgers, pulled pork, brisket...anything! Mix together well and store any unused dry rub in an airtight container in a cool place. I like to mix it together by pulsing it together in the food processor. This ensures it is very well blended and also breaks up any lumps in the brown sugar. Sauté the garlic in the oil over medium heat for just a minute before adding the tomatoes, brown sugar, chili sauce, salt, pepper. Continue to cook until the tomatoes soften and the compote reduces to a jam-like consistency. Add the balsamic vinegar in the final minute or two of cooking before serving. I’m going to try this rub on a pork loin and smoke it. I was planning on using apple wood or cherry wood chips. Do you recommend I baste it with anything during the process? I don’t baste mine at all. Mine too. I just made a huge batch to share with some friends. I love BBQ season! Excellent rub! I tried my hand at smoking a pork loin and chicken on my gas grill and used this spice rub to crust the meats. Fantastic! After 4 hrs of slow smoking at ~250 everything had a wonderful crust that helped keep the juices in the meats and totally complemented the smoke. The brown sugar in the rub creates a beautiful caramel crust that blackens over time and and helps bake all the spices into the meat. But thumbs up!! I’ll be using this as a go-to for any protein that I may think of barbecuing. This dry rub is in a word: INCREDIBLE!! Since trying it last summer, we have used to smoke numerous pork butts, spareribs, chicken and chicken wings as well as 2 corned beef briskets for St. Pattie’s Day this year — all of which have turned out delicious garnering rave reviews from everyone who has eaten them. Our hats off to Barry for an awesome dry rub!! Just made a big batch of this myself. Everyone who tries it at our house ants to take it home! We always have plenty on hand. This BBQ rub was amazing! I have a house full of different picky eaters and it was a hit with everyone! Thanks so much for sharing!